Tip: The audio guides are a perfect way to dive a bit deeper into the world of art. You can choose between difference themes and each one costs about 5 £. The -Essential Audio Tour- for example introduces 80 highlights of the collection and helps you to get a better understanding of the artworks. The National Gallery in London is the top art museum for classical painting. More than 2000 paintings of different art epochs from the 13th century up to the early 20th century are exhibited there. The art museum is divided into 4 areas and each of the area is dedicated to certain centuries. Those areas are split into numbered rooms which cover a special topic. The entrance is free of charge. And that not only for the permanent exhibitions but also for some temporary exhibitions. Even the guided tours, which are offered daily, are free of charge. Of course, many visitors use this tempting offer of art highlights. 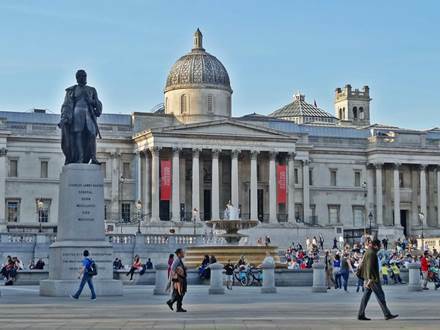 It is easy accessible for tourists due to the central location at the Trafalgar Square. 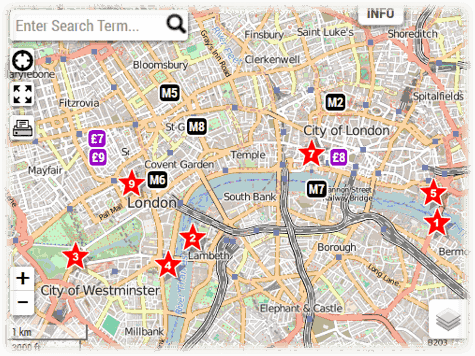 It is no wonder that it belongs to the most visited museums in London. If you want to admire some of the masterpieces without hustle and bustle, you should start your visit as early as possible and begin your tour against the flow of visitors. By doing that, you should be able to use one of the numerous seating possibilities to relax while you enjoy the paintings. 1. 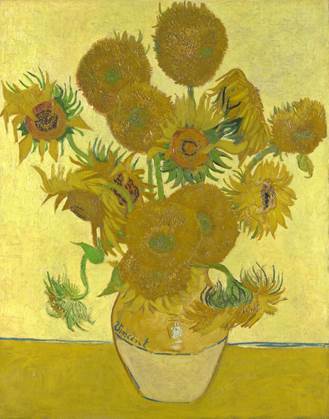 The Sunflowers (Room 41) by Vincent van Gogh belongs to the most famous highlight among the exhibited paintings. He painted this picture in the summer of 1888, in southern France, and it is part of a series of paintings with the sunflowers as the subject. With these artworks he wanted to decorate a atelier in southern France which belong to a painter friend. Vincent painted these pictures directly from the motif. He painted every picture in a single pass without interruption, as the sunflowers fade quite quickly. 2. The Water-Lily Pond (Room 41) was created by Claude Monet in his garden, which is located in the Normandy, in the year 1899. Claude Monet laid out his garden with the water-lily pond himself. He spent a lot of time there in the last 30 years of his life . 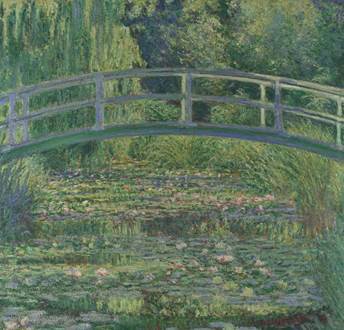 The Japanese Bridge was a popular motif and graced a whole series of his paintings in various views. 3. 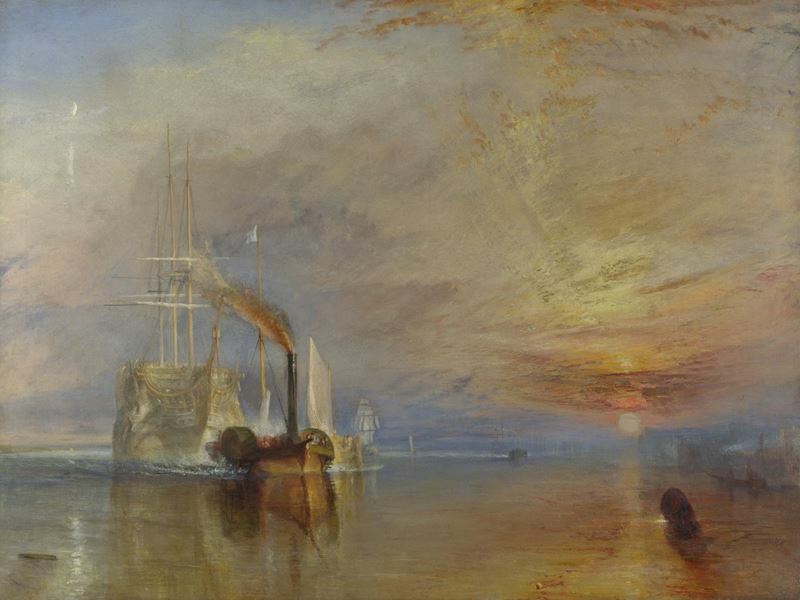 The painting The Fighting Temeraire (Room 34) was elected as the best British painting in a public poll, which was organized by the BBC, in the year 2005. The famous landscape painter J. M. W. Turner is a London native and painted this artwork in the year 1839. He was also known as -the painter of light-. If you look at this painting, there is probably no better name for this special artist. 4. Leonardo da Vinci painted two versions of The Virgin of the Rocks (Room 66). The second variant, which is located here in London, was started by Leonardo in the year 1491 and has probably been completed by one of his students in 1508. The first version is exhibited at the Louvre in Paris. The representation of light and shadow is outstanding in this painting by Leonardo. 5. The Skiff (Room 44) was painted by Pierre-Auguste Renoir in the year 1875. It shows a rowing boat (skiff) on the river Seine at the town Chatou, west of Paris. By using high-contrast color combinations in this painting, Pierre-Auguste Renoir captured vividly a beautiful summer day. 6. The painting A Young Woman standing at a Virginal (Room 16) was painted by the Dutch painter Johannes Vermeer in the year 1670. Only 37 works are associated with the baroque artists and he was not especially popular until the 19th century. In our days he is one of the most famous Dutch painters. 7. 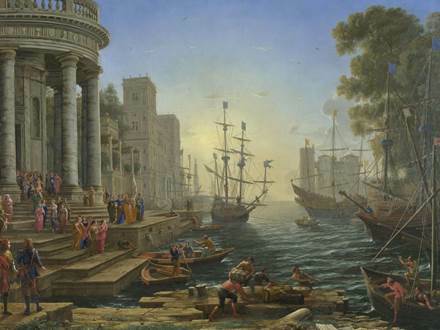 Claude Gellée painted Seaport with the Embarkation of Saint Ursula (Room 29) in the year 1641. The Baroque painter was born in France but spent most of his life in Rome. Due to his idealistic representation of landscapes he had some influence not only in the art of painting of his time but also in the landscape designing itself. This painting shows the Saint Ursula which holds a flag. According to a legend she went on a pilgrimage to Rome, together with 11,000 virgins in the 4th century. On her return to Cologne, the virgins and she were killed by Huns.